Where did the weekend go? Today I am re-sharing an easy recipe that I threw together one evening without a recipe and it has remained a favorite of mine. These original pics were take in the fall of 2016, so please excuse the fall decor! The meal (Paleo and Whole 30 friendly): turkey meatball soup with zucchini noodles, and roasted tomatoes. This makes 2-3 servings. Oven Roasted Tomato: Heat your oven to 350*F. Wash and slice the tomato in half, removing the stem. Place the tomato halves cut-side up on a foil lined baking sheet or non stick baking dish. You can drizzle some olive oil or coconut oil over it if you'd like, I skip that. Sprinkle salt and oregano over the tops of the tomatoes. If you're not eating Paleo/Whole 30 you can also sprinkle Parmesan over the top. Roast the tomatoes for 35-40 minutes while your soup is cooking. Turkey Meatballs: Using 8 oz ground turkey, add one organic egg, 1/2 cup almond meal, 1/4 cup ground psyllium husks, 2 tbsp oregano, 1 tbsp dried basil, 2 tbsp Italian seasoning, and pink Himalayan salt (as much as you think you'd like). You can vary the amounts of seasonings here, but you want to make sure to use a lot because we're not using Parmesan cheese so you'll need the flavor to come from somewhere else! Also, the psyllium husks help the meatballs stay together when cooking as well as add nutritional value. You should yield about 12 meatballs depending on how large you roll them. This is slightly different than how I made meatballs before because of the psyllium husks. Italian Soup Base: Saute 1/2 onion in 1 to 2 tbsp olive oil over medium heat. Add in 2 diced garlic cloves and 1/4 diced jalapeno (optional) once the onions begin to turn translucent. When the garlic becomes fragrant, add in 1/2 can petite diced tomatoes, 1 32 oz box chicken broth, 1 tbsp garlic powder, 1/2 tbsp onion powder, 1/4 tbsp white ground pepper, 1/4 tbsp group coriander, 1 tbsp oregano, 1 tbsp rosemary, and pink Himalayan salt to taste. Sample the soup base for flavor to make adjustments before adding in the meatballs because once the raw meat is in there you'll need to wait until it's done cooking to taste and add any additional seasoning if you think it needs adjusting. Once you add the meatballs, bring the soup to a low boil and let it simmer for about 30 minutes. You can cook the soup at a higher temperature if you're in a rush, but the meatballs will cook faster and thus gives less time for the soup broth to soak in to them. Before removing from the stove, make sure to cut into one meatball to check to make sure they're fully cooked. 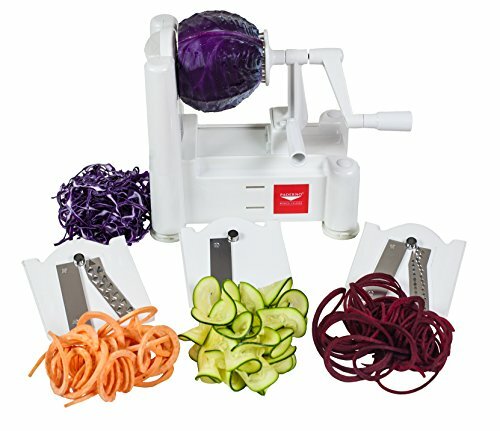 Closer to the end of the soup being ready, you'll want to spiralize the (washed) zucchini using blade C if you have the Paderno Tri-Blade spiralizer to make spaghetti sized noodles. Remove the soup from the direct heat and add in the zucchini noodles. I let this sit to cook the noodles while allowing the soup to cool down a little bit while I pulled the roasted tomatoes out of the oven and prepped the table. You do not want the noodles to "cook" too long because they may get soggy and I wanted them to be al dente. They were the perfect texture with a slight crunch to them (meaning, they weren't soggy) when I sat down to eat the soup. This recipe can easily be adjusted to better suit your preferences so don't be afraid to mix it up a bit. That was the first time I've used zucchini noodles in a soup and I was very pleased with the result! If you enjoyed this post please subscribe below and make sure to share with someone! You can also view previous recipes I've shared here.